If the kitchen is the heart of the home, then the pantry is what keeps it ticking. It’s no secret that a well-stocked pantry simplifies kitchen productions. The trick is organizing it — and keeping it organized — so that it becomes a joy to use, rather than a chore. 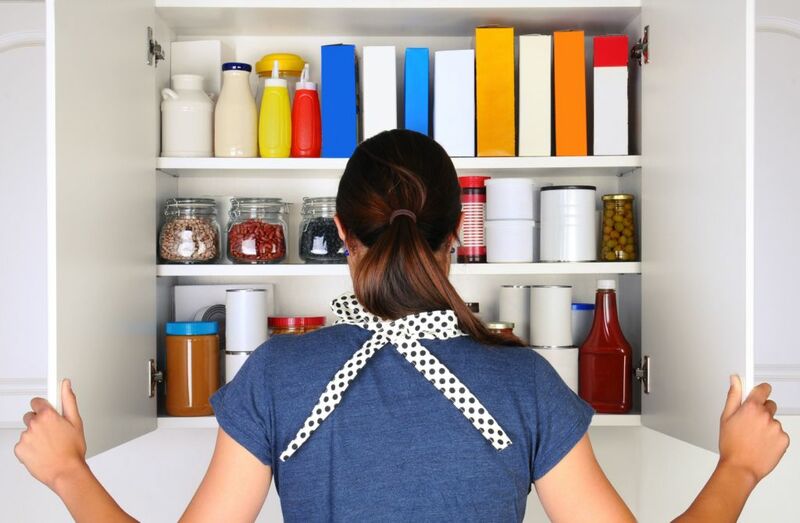 Follow these six essential tips for maintaining a pretty pantry. Use wall or stackable shelves to make use of empty vertical space. Don’t forget stackable drawers for larger items and, again, think “up” — instead of nestling them side-by-side, stack them up high (and secured to the wall) to free up valuable floor space. If your pantry has a door, a door organizer hung onto the back can hold unwieldy items like your Swifter, mop and even larger BBQ utensils. Not only will they have a home, but they’ll be out of sight. It’s worth investing in matching containers, which will not only serve a purpose as storage, but also create a sense of unity and visual harmony. Large mason jars are a quick and inexpensive way to corral baking ingredients, for example. Plus, you can see immediately if you’re running low on anything. For larger items, baskets are an attractive and efficient way to group things like crackers and snacks into subdivided categories: salty snacks, sweet snacks, kids’ snacks, etc. Invest in a label maker and never misplace anything again. Labelling everything is absolutely necessary in a place like a pantry where turnover is high, and especially if more than one person has access. It all seems like a perfect system until somebody adds sesame seeds into the quinoa jar. Matching labels, like matching containers, help give your pantry a cohesive foundation that you’ll be more inclined to keep organized. If you’re more into freehand calligraphy or doodling, explore sticker labels. Keep track of what’s in your pantry by maintaining a general list of what’s in it, especially for items that have a shorter shelf life. Update this list as you plan for your week, adding ingredients you need to buy to complete your snacks and meals. You can do this on a device with a spreadsheet if you’re digitally inclined, but a simple dry erase board or chalk board can be a fun and even entertaining way to communicate with everyone in your household what needs to be replenished in the pantry. 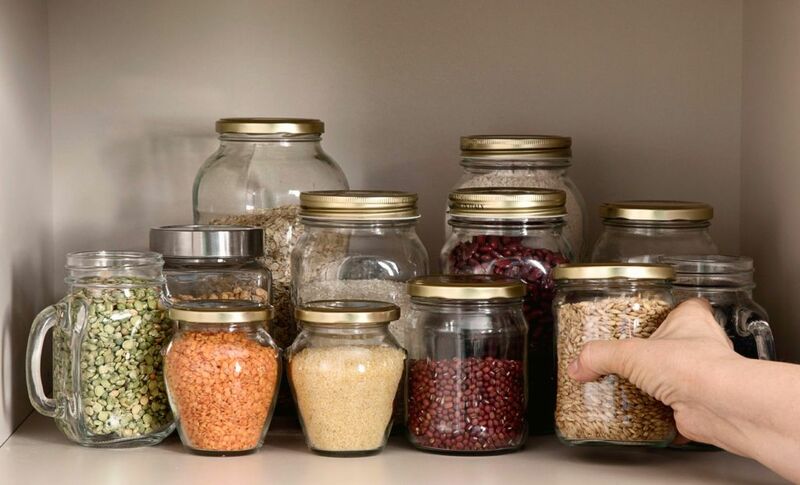 Organize your pantry into zones the way your favourite supermarket does: grains and cereals, sweets and baking ingredients, canned goods, crunchy snacks, etc. We already know this system from decades of grocery shopping, so applying this method in your home pantry should make sorting and retrieving items much easier. Also, don’t use up all the available space; give yourself some breathing room for special occasions that will need their own prepping zone. For example, you might audit your pantry once a year so a special bin for “eat now” items that are soon to expire is handy to have. Or when you’re planning a big holiday party or prepping for a camping trip, you’ll want some extra space for containers that will accommodate this sudden but short-lived abundance in groceries. Your pantry is not the walled version of your junk drawer. Once you’re happy with your supply level, implement a strict “something in, something out” rule. Bring something new in, take something out (unless you’re replacing something already gone). That way your net products will remain the same, so you’ll never be surprised to find a half-eaten bag of potato chips buried in the back, only to have to throw it away. Looking for more organizing tips? Here’s a look at how to organize your home office. Hi everyone, Amanda here again from The Mommy Mix. I’m not going to lie or try to pretend I’m something I’m not, when it comes to being organized I’m a hot mess mom! I’m lucky if I can remember to send in my kids’ milk orders on time and unless I have an appointment written everywhere I’ll most likely miss it. Not this year, 2018 is going to be my year to get organized and stay that way. It can be your year to get organized too if you join me in following some simple steps. When it comes to remembering things that need to be done you can pretty much guarantee that they’re going to pop into your head at the worst times; while you’re lying in bed, out shopping, sitting at work… Make sure you’ve always got a Notepad and pen nearby so you can start a list and every time your memory decides to start working you can add a quick note about the task you need to get done. You can make your “reminder notepad” super personal to who you are and what (or who) motivates you with your own images and text. Whether you’re looking for something that allows you to enter specifics or you just want to circle a few important dates, you need to find a calendar that works for you. At the London Drugs Photolab you can create unique and personalized Photo Calendars in a variety of themes and styles with your own pictures that can also act as reminders of birthdays or any other special events in your life. The calendars span 12 months, but you can start the calendar on any month, so you can create new calendars any time of year! If you’ve chosen a Traditional, one of the Coil Bound Photo Calendars or even something compact like the Desktop Photo Calendar than I’m sure it’s safe to say you want to be able to track details, and now you can. Remember the lists that you’ve been making; transfer anything from it of importance on your calendar, write down any bill payment due dates plus don’t forget birthdays, anniversaries and appointments. Make it a point to look at your calendar at least once a week. You go in your fridge every day, right?! Stick a Magnetic Memo Board to it so every time you go grab the milk for your morning coffee or cook dinner, your bake sale tasks, appointments and special days for the week will be staring you in the face every day! What tips do you have for getting organized in 2018? For more personalized organization tools visit the London Drugs Photolab online, in-store, or simply download the London Drugs Photolab App (available for both iOS and Android devices)!